DOING ART: There are some businesses that do not need cracking heads or investing much, and many of such come with talent. Desire Kakuyo is one of the lucky people doing something from his talent. I do art and crafts. When did you start doing this business? I started doing it professionally in 2016. I love art and the creativity that comes with it, and I happen to be blessed with the talent, which I feel is the utmost reason I have managed to keep doing this business. Did you go to school to do this kind of job? I learnt how to do this at Makerere University, Margaret Trowell School of Industrial and Fine Art. What kind of art and craft do you do? I do pencil and coloured portraits as well as commissioned artwork for hotels and bars. 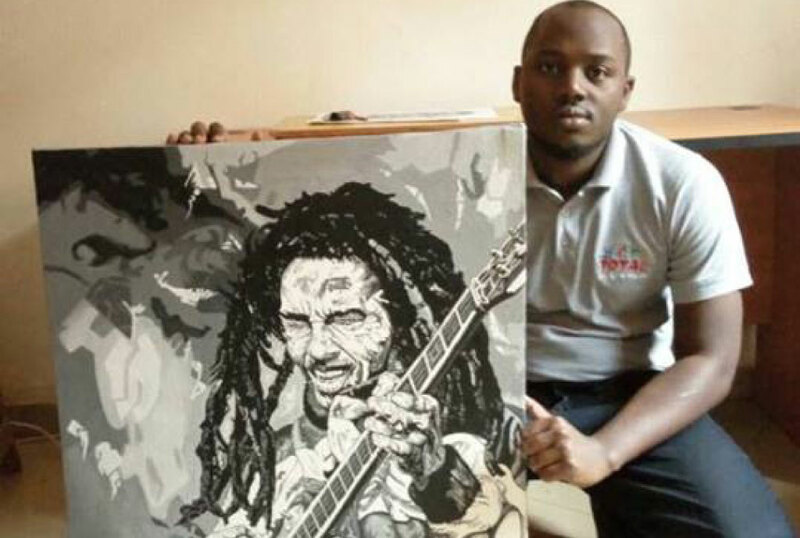 I started with Shs500,000, which I used to buy brushes, paint and canvas. How much do you charge to make a piece of art? I charge Shs250,000 for a single framed pencil portrait, Shs350,000 to Shs400,000 for a multiple pencil portrait. I charge 80k to 100k for small pieces, 150k to 200k for medium pieces and 400k for large ones. How many days does it take you to finish a piece? It takes me one to two days to complete a pencil piece and one to three days for a painting. How many clients do you get in a day? I get on average an order a day but during some busy seasons, I can even get upto four orders a day. Where do you get the materials you use to make paintings? I buy materials from shops on Nasser Road and also at Aristoc. My business does not have a specific location but I do most of my work from home in Entebbe. I deliver work to my clients personally. What challenges do you face doing this business? Some clients fail to pay for the work they ordered while some buyers also have a tendency of undervaluing work or some do not know what kind of work they need. There is also an issue of prices, as the materials I use get more expensive each passing day.